The Inflatable Poop Emoji Costume will be the craziest costume this Halloween. Ew! What's that smell? It's this giant pile of poo. 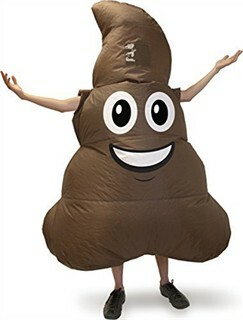 This poop emoji costume easily inflates with the battery powered fan. No farting in this poop jumpsuit or you'll really be a stinky turd. Need to send a hilarious text? The poop emoji never fails to make them laugh. Pair up with our other emoji costumes for a great emoji group costume. Availability:The Inflatable Poop Emoji Costume takes approximately 1 business day to leave the warehouse, in addition to transit time.